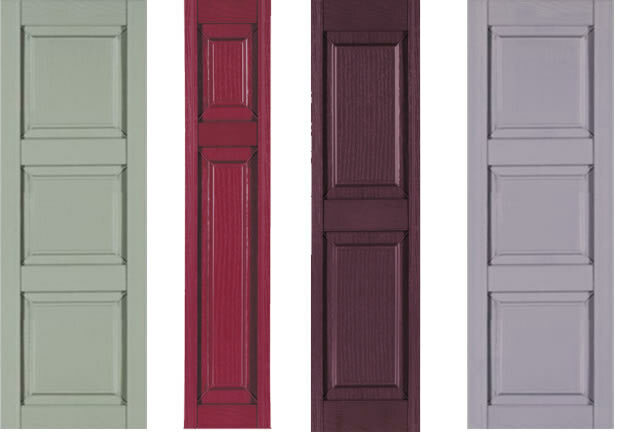 Styles like Bennington, Tamarisk, Foxmore, Chadwick - NO EXTRA CHARGE if only one colour is used in manufacturing. 3 panels are not recommended for shutters under 60" long. 1 panel is recommended for shutters under 24" long. Shutters over 96" MUST have 3 or 4 panels, included in the price. Longest one panel shutters 48" ( Bennington, William ). ALL OFF-STANDARD ORDERS REQUIRE DRAWING WITH MEASURMENTS. SHUTTERS CAN BE EASILY CLEANED USING MILD DISH SOAP AND WATER TO MAINTAIN THEIR LUSTER. Please call us for a quote. Shutter quantity *must* be ordered in pairs, otherwise stated. Please see below. NOTE: The cost of half of pair is 75% the cost of a full pair. Shutter quantity *must* be specified in pairs. For example: 3 individual panels are 1 and ½ pair. Order quantity mistakenly stated in single pieces (1/2 of a pair) will be charged at an additional 25% surcharge to cover wasted material. For example: stating “4 pieces” instead of “2 pair” will be filled as 4 pair. No surcharge will be charge if the order is paid in full, but if only 2 pair are paid for, a misstated order surcharge of 25% will be added to the bill. Copyright © 2014 Suntown All rights reserved.